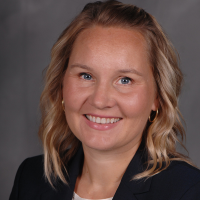 Dr. Sanna Harjusola-Webb is an associate professor of early childhood special education in the School of Lifespan Development and Educational Sciences. Dr. Harjusola-Webb earned her Ph.D. in Early Childhood Special Education from the University of Kansas. At Kent State University, her research, teaching, and service activities focus on empowering early intervention professionals and families with young children with and without disabilities. Her research interests include early language development and practices that support positive adult child interactions. Dr. Harjusola-Webb maintains collaborative partnerships with multiple community and state agencies. She currently serves as a PI of a multiyear U.S. Department of Education early intervention personnel preparation grant that utilizes distance education, tele early intervention practices, and cyber supervision technologies.